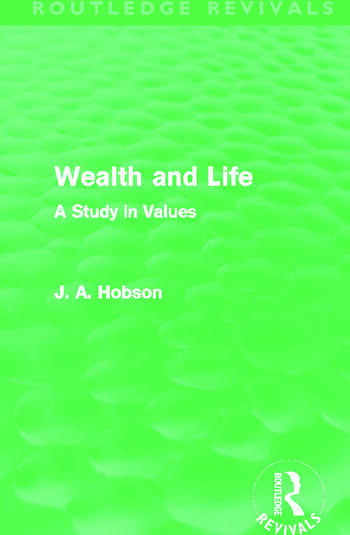 First published in 1930, this book endeavours to trace and express the relations between economic and human values, between wealth and life. Hobson studies everything from the role of production processes and consumption in the determination of human welfare; to the changing attitudes of economic science towards ethical considerations; as well as the tendency of organised society to exercise a control of economic processes in the interests of equity, humanity, and social order. Part I of the book deals with an attempt to provide an intelligible and consistent meaning for human value and welfare. Part II sketches the emergence of an economic science and its formal relations to ethics. Part III discusses the ethical significance of certain basic factors in the modern economic system, especially property and market processes. Part IV is addressed to the notion of industrial peace and progress in the light of modern humanism, with especial regard to the new problems emerging in a world becoming conscious of its widening unity.